The new Cooper Zeon RS3-G1 is crafted with leading technology and innovations that meet the needs of the high performance consumer. 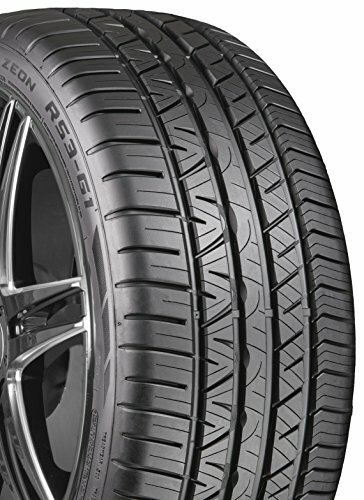 The tire’s wide, flat tread arc creates a stable, square footprint, which provides plenty of road-gripping rubber. The tire’s tread design contains a whole host of leading innovative features to create grip, stability, and durability. No matter if you’re driving on dry pavement, wet pavement, or even light snow conditions, the Cooper RS3-G1 is truly an all-season ultra high performance tire. More Siping at Half-Worn - The RS3-G1 utilizes 3-D full-depth siping technology. This technology allows the sipes to go deep into the tread element, down to 2/32nds. Therefore, at half-worn the RS3-G1 has siping left to provide biting edges, keeping the performance consistent and enhancing the worn look of the tire. Ultra High Performance Construction - The sidewall is designed with a stiff rubber component inside the tire. Its purpose is to translate steering inputs from the rim to the road. The unique design of this bead filler component makes the RS3-G1 have a quick response providing feedback and confidence on the road. The rim protector extends beyond the rim flange and reduces the likelihood of rim damage that can occur if a curb is scuffed. A nylon overwrap combats centrifugal force under high-speed applications.